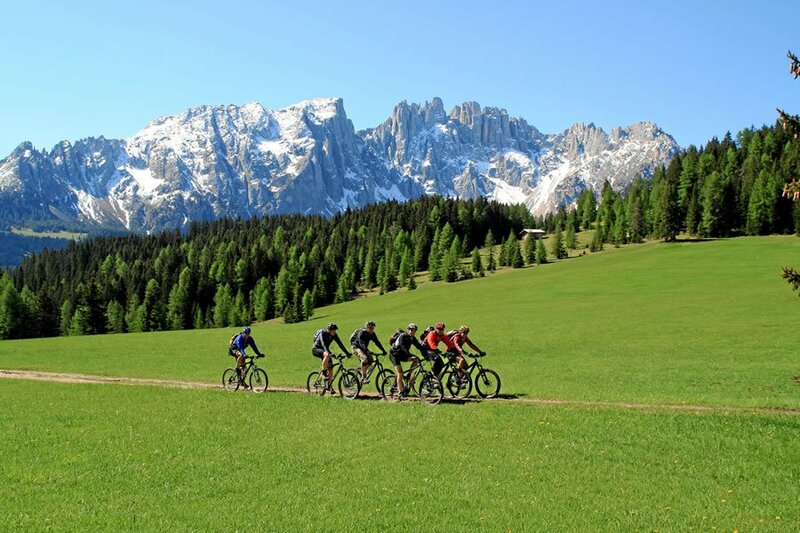 Challenging alpine mountain bike trails, steep pass crossings and easy bicycle paths along Lake Carezza – The Dolomites region around Nova Levante offers excellent conditions for a varied biking holiday in South Tyrol. The farm Karerhof in the holiday region Catinaccio is an excellent starting point for bike trips into the alpine regions. On the Lake Carezza Tour you will ride all around the crystal clear lake on a mountain bike. The itinerary leads through the deep forests that surround the lake, and along the way you may enjoy magnificent views of the Catinaccio mountain range. The easy tour is also suitable for inexperienced bikers. During your bike holiday in South Tyrol, beautiful alpine tours take you into the mountainous areas around Nova Levante. 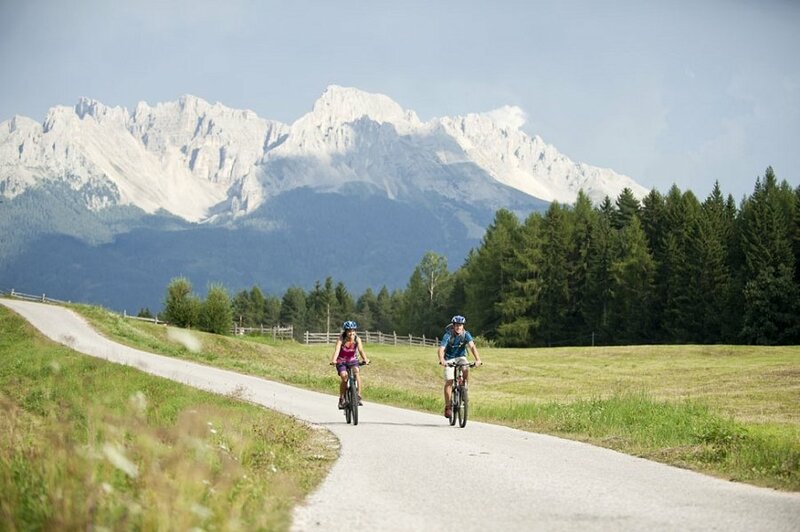 On the challenging mountain bike tour to the Laner Alm, you will conquer more than 1,000 altitude meters, and the rocky single trails will be a true challenge even for experienced bikers. Another highlight is a bike ride to the Niger Pass, where you will ride past the turquoise Lake Carezza. A special treat for those who love racing bike tours: the ambitious bike tour to the Carezza Pass. It is located between the mountain ranges of Catinaccio and Latemar and reaches its highest point at an altitude of 1,745 meters. The Catinaccio is a distinctive rock formation in the Dolomites, which creates a fantastic setting for unforgettable bike tours. The unique mountain scenery can be enjoyed during bike trips in Nova Levante. Numerous single trails pass through the mountain region, and traditional alpine huts and mountain restaurants invite you to stop by the roadside. Right below the Catinaccio, a mountain bike trail leads to the farm Schillerhof. Starting from Nova Levante, you will ride along the valley Locherertal to the Niger Pass, and then follow the road signs. On the way back you may look forward to an exciting downhill ride that leads back into the valley on challenging singlet trails. 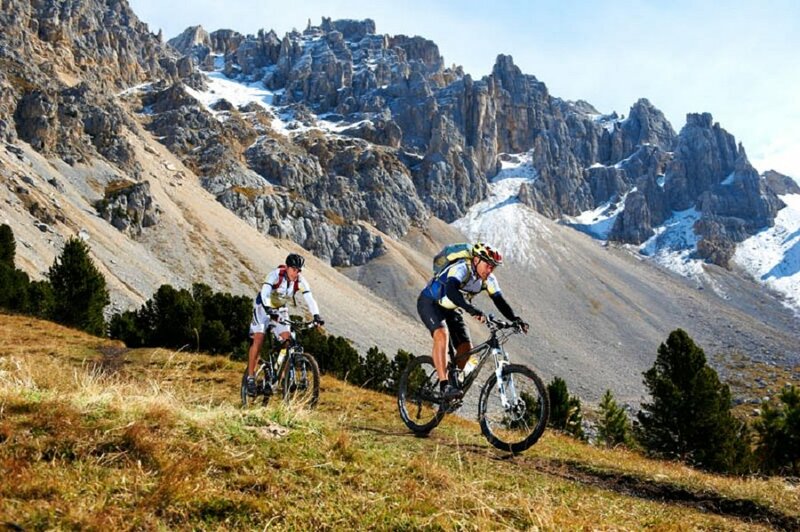 In the summer months, the Tourist Office Val d’Ega offers guided mountain bike tours in the mountains of Val d’Ega. You may sign up for these guided tours by phone or by e-mail.